Boeing 747 G-GAFX is seen here crossing Amsterdam's runway 06/24, taxiing from theSierra-ramp to runway 01L for departure. We are pleased to inform our customers that our service will resume shortly. Future routes will cover the Middle East and Hong Kong." 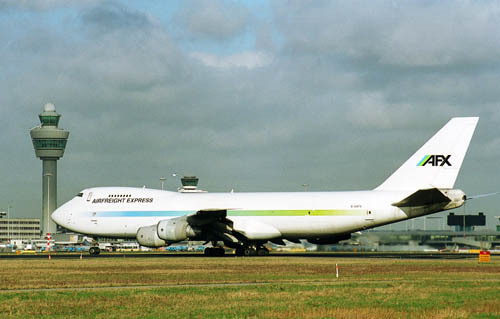 During January 2003 it did seem that AFX had restarted operations, with cargo flights on behalf of Maylasian Airlines (MAS). The contents of the website had not been altered. During Feb03 I saw G-INTL with AFX-titles on its tail taxiing at Amsterdam Int'l Airport, operating a flight from Amsterdam to Dubai with final destination Kuala Lumpur,Malaysia under Air Atlanta Iceland flight number (CC-prefix). But on 03Apr03 G-INTL was again reported as stored at LON-Stansted (STN).